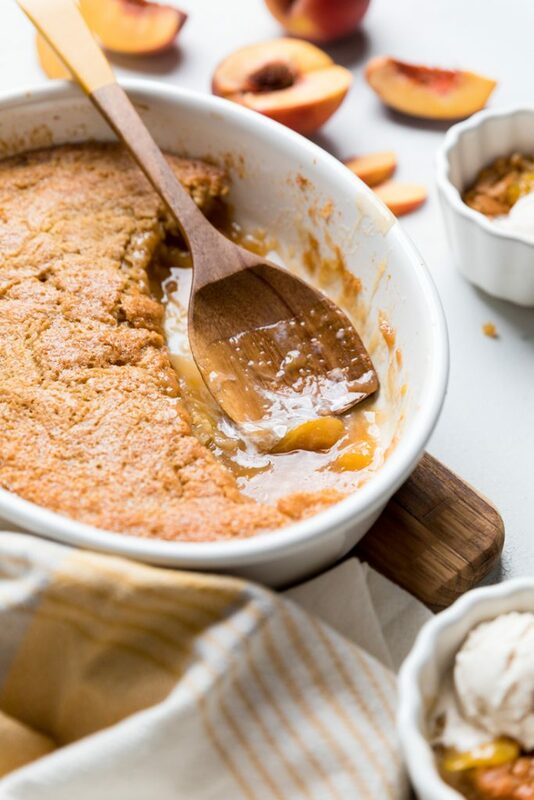 This is the absolute best vegan peach cobbler recipe you will ever have! This completely from scratch dairy free peach cobbler needs just 11 ingredients and is super easy to throw together. Peach cobbler is a classic Southern dessert. If you have ever visited, you have likely had some or had someone offer it to you. May until September is classic peach season, but we’ll explain how to make fresh or canned vegan peach cobbler so you can enjoy this dish year round. 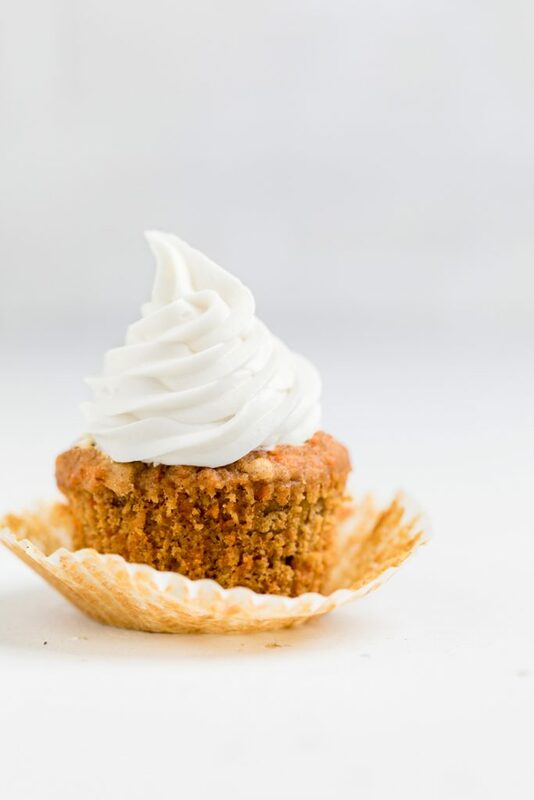 Just because you have food preferences or allergies doesn’t mean you shouldn’t be able to enjoy this delicious dessert. We’ve made this a completely vegan peach cobbler. This recipe comes together in just about 45 minutes, making a fun a perfect dessert to throw into the oven just as you are sitting down for a spring or summer get together, holiday or party! What is a peach cobbler? A peach cobbler has just a few essential needs – fruit in the form of peaches for this dairy free peach cobbler, a sweet dough and butter. It’s a classic dessert recipe that is thought to originate as people started to settle in the US. Settlers had classic pie recipes, but they weren’t great for “road life”, so they took a similar concept and cooked this dessert over an open fire instead. The result is a delicious dessert of butter and cooked peaches with a sweet dough coming through. It’s similar to a pie, but not. And it’s usually served with ice cream or whipped topping. What ingredients are in a vegan peach cobbler? 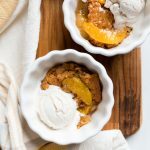 How do you make a vegan peach cobbler? 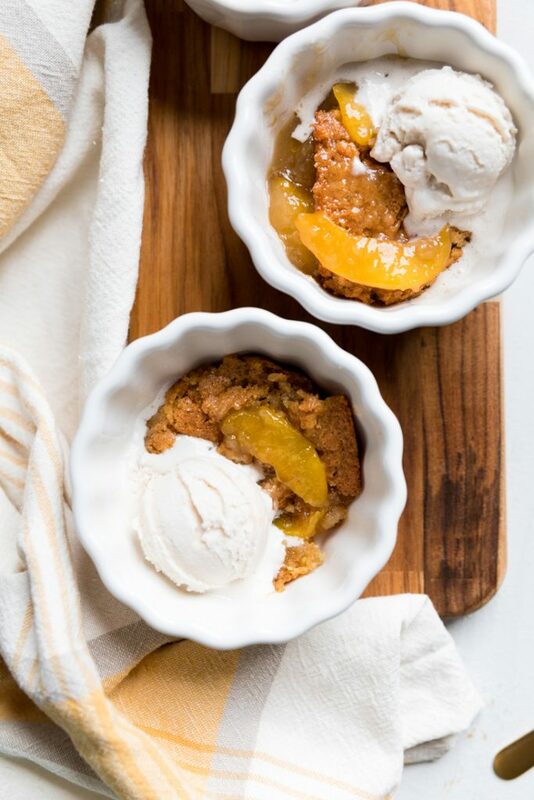 You may hear Southern dessert and think it’s going to be an elaborate process, but I promise you it isn’t hard at all to make this dairy free peach cobbler recipe. To start, preheat your oven to 350 degrees. Add your butter to your casserole dish and place in the oven. Remove when butter is completely melted, about 5-7 minutes. Next, you want to peel the skin off your peaches. Then, cut them in half and remove the seed and any seed remnants. Slice the peaches into equal size slices. Inside of a large skillet, add the sliced peaches, sugar and salt over medium heat. Stir and cook for about 5 minutes. The peaches will get really juicy as the sugar dissolves into them. Remove and set aside. In a large bowl, add the flour, brown sugar, baking powder, and salt. Whisk together. Pour in the maple syrup, vanilla extract, and dairy free milk. Pour this batter into the casserole dish over the butter. Spread out into an even layer as much as possible. Some of the butter will come up over it and that is fine, but do not stir them together. Pour the peaches and juice over top of the mixture in the casserole dish. Sprinkle with ground cinnamon on top. Place in pre-heated oven for 35-45 minutes. Check for doneness of the sweet dough mixture. A toothpick inserted should come out clean. Remove from oven and let sit for 15-20 minutes. Serve with vegan whipped topping or vanilla ice cream. Can you make this Top 8 Allergen Friendly Peach Cobbler? 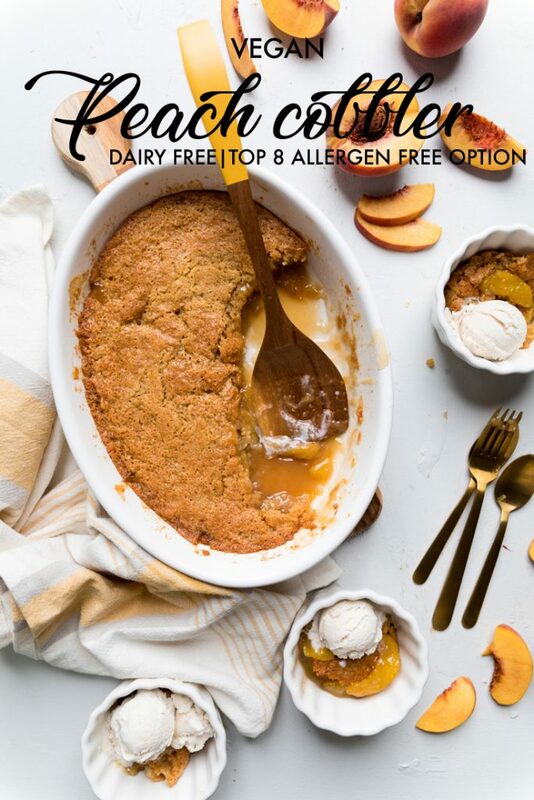 The two ingredients that make this vegan peach cobbler recipe as written not Top 8 Allergy Friendly are the flour and almond milk. Feel free to easily swap the almond milk with any dairy free safe milk that you are able to have – oat, flax or hemp would be easy to swap and find. You can try to swap out the flour for King Arthur’s Measure for Measure Gluten Free flour. Full disclosure, we have not personally try this for this recipe, but we had had success with this flour over others. 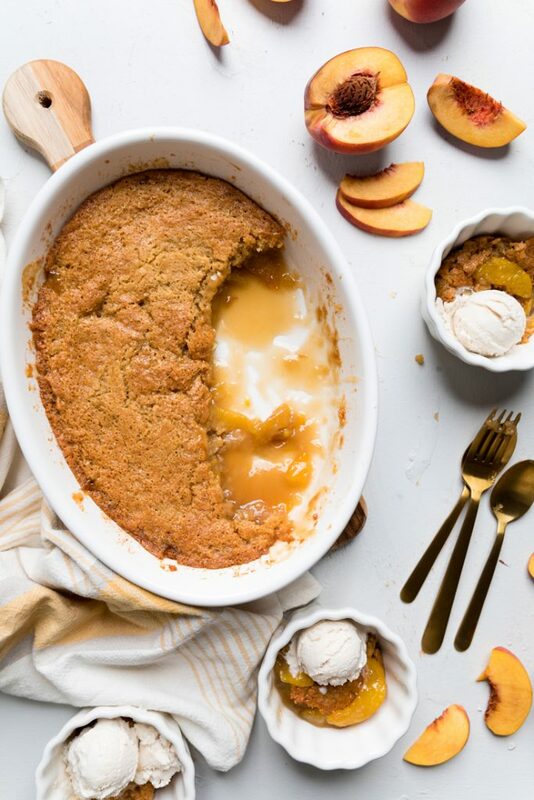 Should dairy free peach cobbler be served hot or cold? This peach cobbler recipe can be served warm or cold. Personally, I prefer it warm whether right out of the microwave or warmed up in the microwave, but it can absolutely be eaten cold. Can I use canned peaches for this vegan peach cobbler? While we highly recommend in season fresh peaches for this dairy free peach cobbler, we also realize the need to make this recipe year round. We would never want to limit your ability to only make during a few months. That being said, you can replace the amount of peaches this recipe calls for with 2 16-ounce cans of peaches. 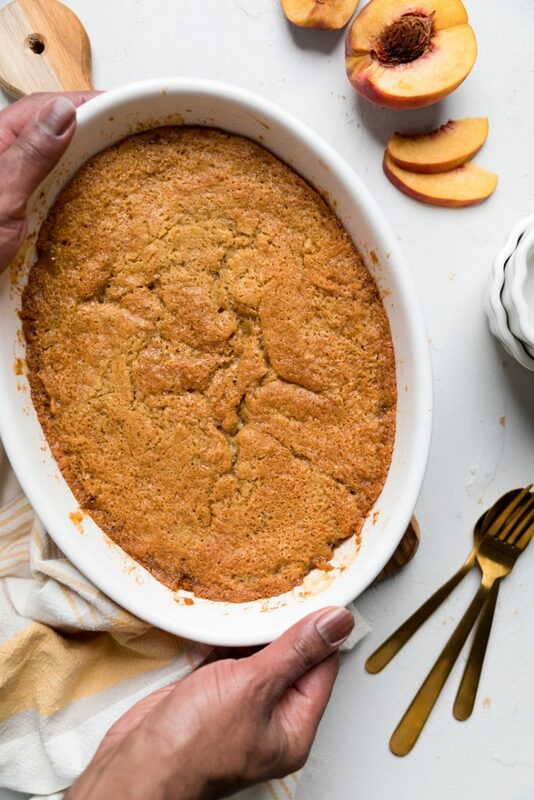 If using canned peaches for this vegan peach cobbler, you will omit the cooking of the peaches and just pour the canned peaches and the juice from the can directly over the batter. Alternatively, you could also use frozen peaches if you can find them in the store. Let them defrost at room temperature and then cook them according to the directions for fresh. How do you store vegan peach cobbler? 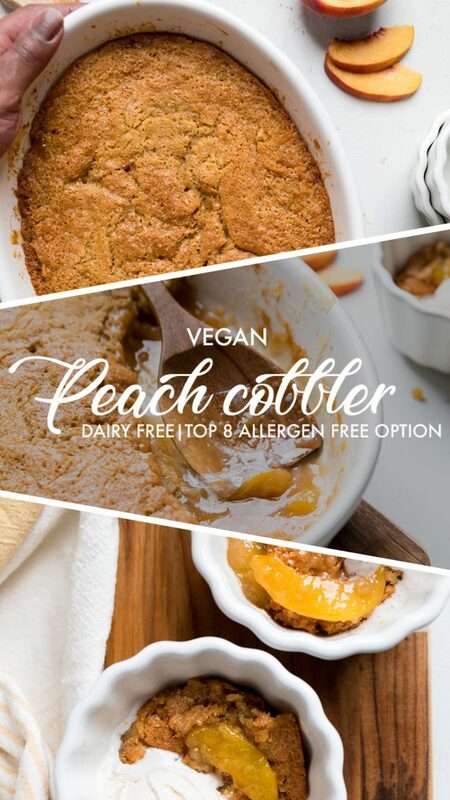 Once the vegan peach cobbler is cooled completely, you can cover the casserole dish (or move the leftovers to a smaller air tight container and store in the refrigerator. Eat within 2-3 days. What are other vegan dessert ideas that I should try? Add butter to 9×13 casserole dish and place in the oven. Remove when butter is completely melted, about 5-7 minutes. Peel the skin off peaches. Cut them in half and remove the seed and any seed remnants. Slice the peaches into equal size slices. Inside of a large skillet, add the sliced peaches, 2/3 cup vegan sugar and 1/4 tsp salt over medium heat. Stir and cook for about 5 minutes. The peaches will get really juicy as the sugar dissolves into them. Remove and set aside. In a large bowl, add the flour, brown sugar, baking powder, and salt. Whisk together. Pour in the maple syrup, vanilla extract, and dairy free milk. Pour this batter into the casserole dish over the butter. Spread out into an even layer as much as possible. Some of the butter will come up over it and that is fine, but do not stir them together. Pour the peaches and juice over top of the mixture in the casserole dish. Sprinkle with ground cinnamon on top. *You can do as little as 1/4 teaspoon or as much as a whole teaspoon. Place in pre-heated oven for 35-45 minutes. Check for doneness of the sweet dough mixture. A toothpick inserted should come out clean. Remove from oven and let sit for 15-20 minutes. Serve with vegan whipped topping or vanilla ice cream. *See notes in post about Top 8 Allergens and using canned or frozen peaches.